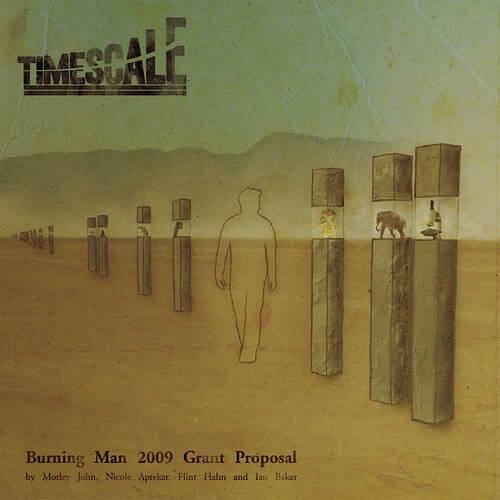 My friend Morley decided to do a massive project for Burning Man 2009, called Timescale. Her team recently put together a grant proposal packet for the folks at Burning Man Headquarters, and asked me to draw the artist’s rendering you see above. planet and the exponential complexity of living things. project, each new significant chapter in the Earth’s history will be marked by an 8-inch square concrete column rising from the playa surface. The 6.5-foot tall column holds a clear box which contains a sculptural representation pertaining to that period of time, and a plaque on the side of the column further details the story of what occurred during that chapter. The final proposal was delivered inside a hollowed out concrete block, which housed a guidebook, and a scale model of the project. The model was in the form of a piece of rope, which was tagged with the location of each concrete column. It was topped with a piece of acrylic which contained the proposal and my rendering. I’m really excited to have helped with this proposal, and I’m even more excited to contribute some art to the installation this summer! The project is a really huge undertaking. I’m so proud of my friends for putting together something so ambitious! While I mentioned it earlier, I wanted to say again how much I liked your final illustration. It really set up the proposal so that you had a sense of it and the mood before one even begins to read anything. I’ve seen a couple other BM proposals and none of them did this effectively. Most the drawings were uninspired and lacked any emotional quality. Also, they were often buried on the 4th or 5th page after reams of text. Aww thanks Colin! I’m really amped on the logo you made, too! This project is going to be really epic. Love for all the ardent folks! I saw this on Nicole’s blog and I love the idea! The illustration is warm and evocative, really captures the feeling of the concept. Only wish Burning Man was a little more affordable so that I could go and see it, ’cause I’m sure It’ll be approved. What a cool way to frame a grant proposal! 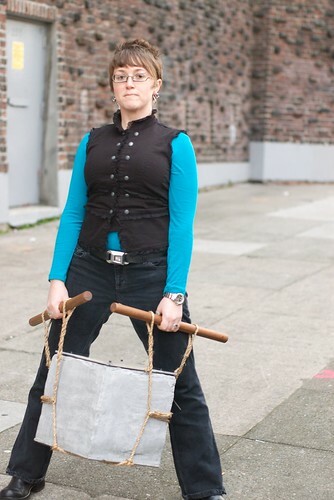 Big ups to you, lady dude.